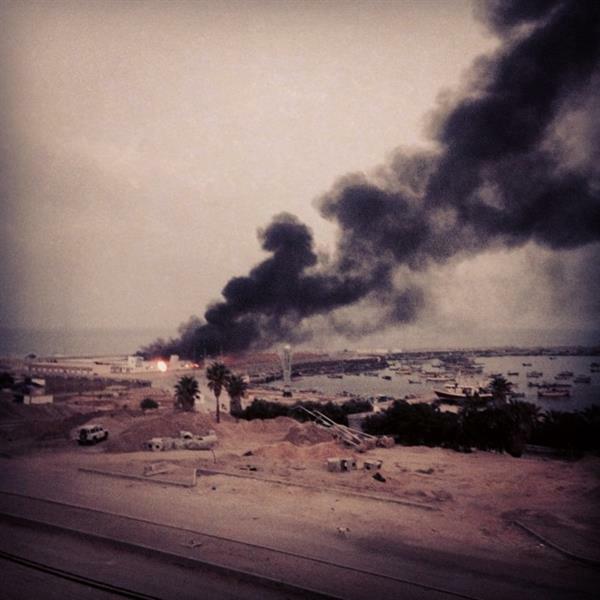 Another image of the port explosion. This one from ITV correspondent Dan Rivers. Our lead story has been updated. Read it here. Muslims world-wide began to celebrate the end of the holy month of Ramadan. But as Al Jazeera's Charles Stratford reports, there's little joy for Palestinians in Gaza. 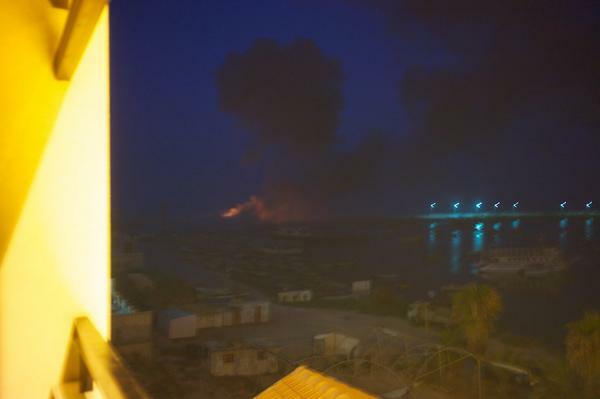 A building within the Gaza port is seen on fire after several strikes early today. The Israeli army has confirmed that five of its soldiers were killed overnight, bringing the total Israeli death toll to 55. 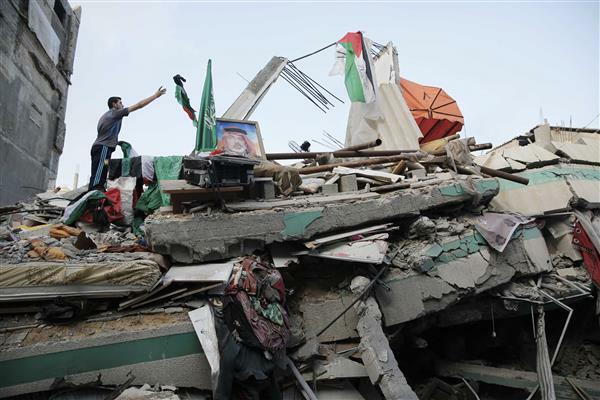 Overnight Israeli jets bombed the home of Ismail Haniyeh, a senior Hamas leader and the former prime minister in Gaza. Home of Hamas Gaza leader Ismail Haniyeh was hit by a missile fired by Israeli aircraft before dawn causing damage but no casualties. 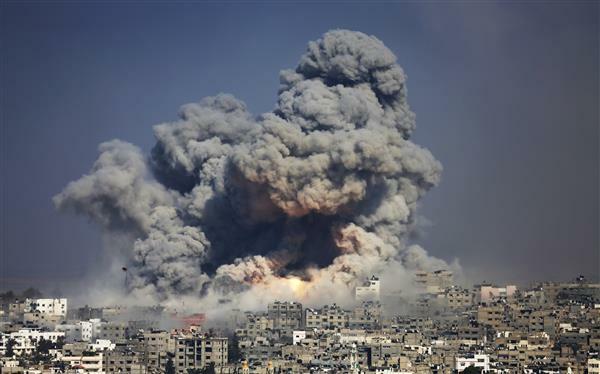 At least 100 Gazans have been killed in Israeli bombardment on Tuesday, Gaza officials have said, hours after shells hit the enclave's only power station. 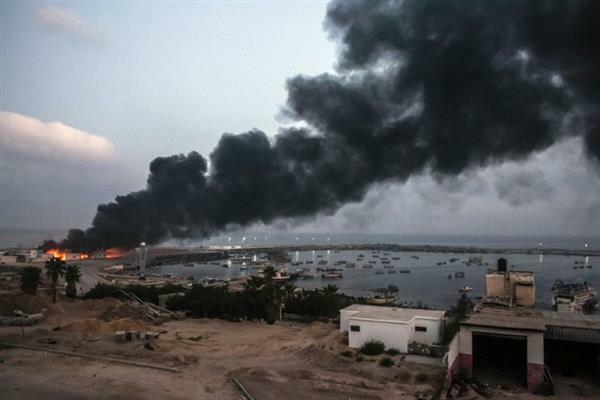 A thick column of black smoke was seen rising from the power station on Tuesday, mingling with other plumes sent into the air by Israeli shelling. All Palestinian factions, including Hamas and Islamic Jihad, have united to offer a 24-hour ceasefire in Gaza, Palestine Liberation Organization said. According to a senior Palestinian leader who spoke to Al Jazeera, Egypt has told all sides in the Gaza conflict that a 24-hour ceasefire must be in place before talks get underway in Cairo. The United Nations agency that looks after Palestinian refugees said on Tuesday it had found a cache of rockets at one of its schools in the Gaza Strip and deplored those who had put them there. United Nations Relief and Works Agency (UNRWA) spokesman Chris Gunness condemned those responsible for placing civilians in harm's way by storing the rockets at the school but he did not specifically blame any particular party. We condemn the group or groups who endangered civilians by placing these munitions in our school. This is yet another flagrant violation of the neutrality of our premises. We call on all the warring parties to respect the inviolability of U.N. property. More than 100 Palestinians have been killed in a single day of fighting in Gaza. Al Jazeera's Charles Stratford reports from the territory's largest refugee centre, now home to more than 100,000 people. Israeli shelling on a UN school being used as a shelter in the Gaza Strip has killed at least 16 people and injured scores of others, the health ministry in Gaza says. Wednesday’s shelling hit the school in Jabaliya refugee camp, emergency services spokesman Ashraf al-Qudra said, on the 23rd day of Israel's military campaign against the Palestinian coastal enclave. Earlier, medics put the death toll at 23. An official for the UN's Palestinian refugee agency (UNRWA) told the AFP news agency that the strike hit a bathroom and two classrooms inside the girls' school. 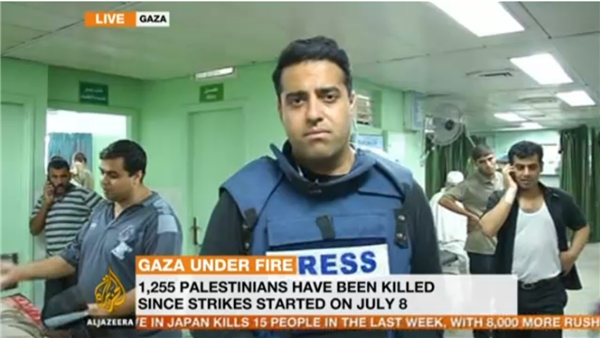 Al Jazeera's Imtiaz Tyab, reporting from Gaza's Kamal Adwan hospital, where scores injured were taken, said there were more than 90 people wounded. "Looking around me I can see some with have what appears to be shrapnel wound and some have far more serious wounds," he said. 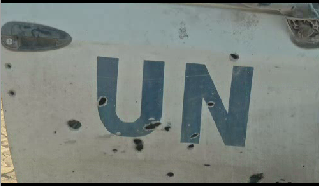 "As we were travelling to the hospital, we saw families with many children leaving other UN schools. They feel insecure. There seemed to be no safe shelter for them in Gaza, not even in UN schools," Tyab said. Our correspondent reports from Kamal Adwan hospital in northern Gaza where the dead and injured from the shelling that hit a UN school were brought to. Remember that you can watch or listen to our live coverage online. Stream it here. REPOST: Our Charles Stratford reports from Gaza's largest refugee centre, which is now home to more than 100,000 people, and was hit by Israeli shelling last night. We are completely overwhelmed. This is a cry from the heart. We can't go on, we've reached breaking point [...] It's intolerable that humanitarian workers are paying such an inordinately high price. It's got to stop. 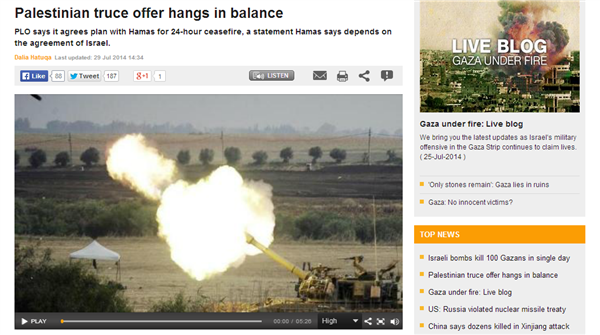 -- The UNRWA's Chris Gunness, on the desperate humanitarian situation in Gaza. Technical note: This is a single-channel audio recording (right). The Israeli army says Hamas fighters have fired over 2,670 rockets into Israel since the beginning of their military offensive against the group in Gaza. 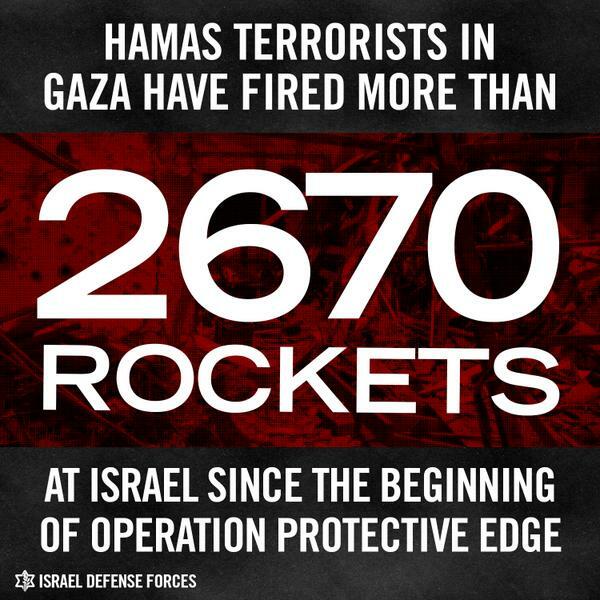 Israel's "Iron Dome" missile defence system has intercepted a number of these rockets. So far, three civilians were killed in Israel, which includes a Thai national. 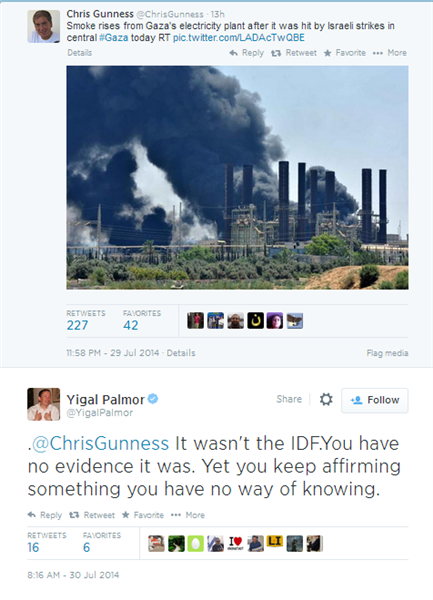 Chris Gunness is the spokesperson for the UNRWA and Yigal Palmor is the spokesperson of Israel's foreign ministry. The US has condemned the bombing of the UN school this morning, but stopped short of blaming Israel. The UN is in no doubt, based on its investigations, that Israeli shells hit the school in Jabaliya, which was being used by 3,300 internal refugees. From Al Jazeera's Mohammed Omer, at Shifa hospital, which received scores of casualties from the market bombing this afternoon. Apology for the typo in Crescent. Palestinian Red Cresent teams arrive every few minutes with new victims, one of the medics says most of those injured had lost body parts due to direct artillery shelling. One of the survivors told Al Jazeera: "When rescue teams and ambulances arrived to the location, than Israeli tank shells continue to hit new locations, causing more victims". Shifa hospital is unable to cope, while hundreds of people are at the gate of Al-Quds hospital in Tal al-Hawwa, just next to an UNRWA school which became shelter for people from Shujayea. 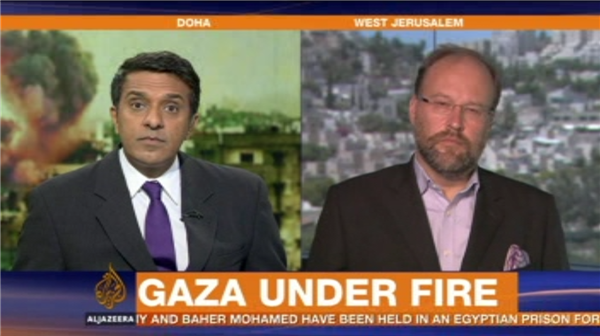 Paul Hirschson, deputy spokesperson with Israeli ministry of foreign affairs, talks to Al Jazeera on his country's offensive on Gaza. The Gaza Health Ministry announced that the death toll in Gaza is now 1361 killed and more than 6780 were injured since the start of Israel’s Protective Edge offensive. 1 Israeli soldier "killed in action whose burial site is unknown"
1 Thai citizen working in Israel was also killed. 13 Palestinians were killed and at least 577 have been injured. At least 388 of them have been injured from live ammunition, according to Al Jazeera sources on the ground. BREAKING: US Department of Defense confirms it has supplied Israel with "munitions"
Israel mobilised 16,000 additional reservists, taking their total to 86,000, as military operations in the Gaza Strip continue, an army spokeswoman said. "The army has issued 16,000 additional mobilisation orders to allow troops on the ground to rest, which takes the total number of reservists to 86,000," said the spokeswoman. 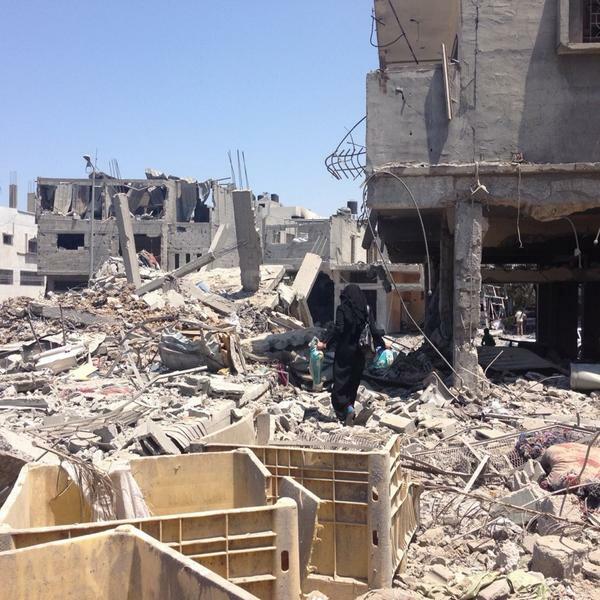 #Gaza: 219,657 displaced Palestinian civilians are now sheltering in 86 UNRWA shelters. That's an average of 2,554 people per school. We struck 110 terror sites in Gaza in the past 24 hours, including 5 command centers. 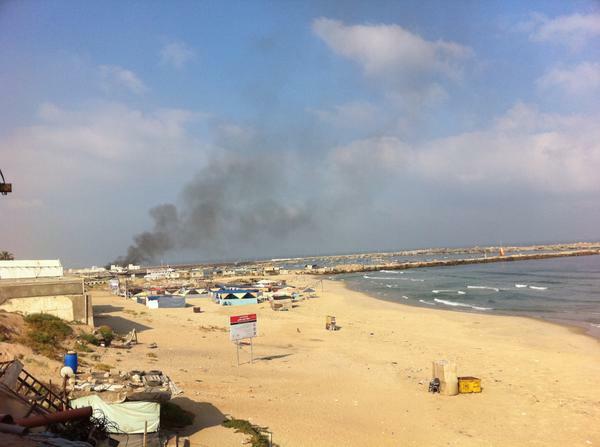 Imtiaz Tyab, reporting from Gaza Strip, says it is relatively quiet this morning. "That said, we were told a mosque at Jabaliya refugee camp has been targeted over the past hour by artillery shelling," Tyab said. At least 10 people were reportedly injured in the bombardment. The Israeli military assault on the Gaza Strip, which began on July 8, has so far claimed the lives of 1,360 Palestinians, including scores of children. More than 7,700 people have been injured. 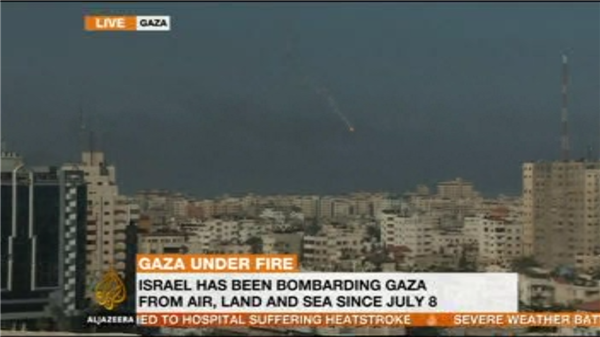 Rockets fired from Gaza into Israel have killed two Israeli civilians and one Thai citizen. The fighting has killed 56 Israeli troops. One soldier remains missing and is presumed dead, according to the Israeli army. through which Hamas has menaced its southern towns and army bases. Major General Sami Turgeman, chief of Israeli forces in Gaza, said on Wednesday they were "but a few days away from destroying all the attack tunnels". The army said 32 of the secret passages had been found so far and half of them blown up. The Israeli cabinet will meet at 11am today in Tel Aviv. The White House is making increasingly strong statements condemning Israeli strikes that kill Palestinian civilians, including Wednesday's attack on the UN school. But at the same time the Pentagon has confirmed they are resupplying the Israeli military, this while President Obama calls for an immediate ceasefire. Al Jazeera's White House Correspondent Patty Culhane reports.